Four little words that mean a lot for quite a few people, us included. Writing them is no easy feat. 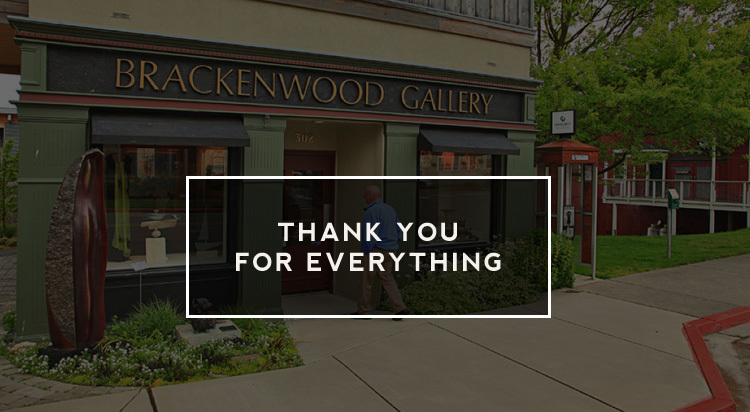 We’ve been involved with Brackenwood almost from the very beginning; first, as part of the gallery roster, then taking over from previous owner dear sweet Rene Neff. The building we’re in has hosted a gallery for a over three decades, through several ownership incarnations. All of them have added to part of the charm that is Langley, here on beautiful Whidbey Island. We’ve gained a tremendous amount of experience that’s been worth every penny and hour we’ve put into the business. As we look to this new year though, new opportunities await that will render continuing to support the gallery an impossible task. February will be our last month in operation in the physical space, and we’ll be open through the month with our standard business hours. While the gallery isn’t really a business that offers fire sales, there are bound to be some good bargains here or there. Please do stop in and say hello if you can! We’ll be spending the first couple weeks of March closing things down, making sure all art has made it to where it needs to go, and tidying things up. We have to acknowledge our wonderful staff: Gail, Fiorella, and Kären. They have truly helped create the inviting space Brackenwood is. It’s been such an honor to have had a chance to work with all of you, to see such amazing pieces in the gallery, and to place them in homes around the world. We’re delighted that there will continue to be a strong Whidbey Island artist presence here in our little village by the sea, with the addition of Rob Schouten Gallery across the street, along with the other great galleries already here in Langley, like Museo, Studio 106, Whidbey Art Gallery, and edit (not to mention, of course, the many local businesses that display art on their walls!). The return of the Front Room Gallery in Bayview, new businesses in Clinton, and our local wineries help round out a lot of places to see art here on the south end of Whidbey. And while the time isn’t right for us right now, we could certainly see ourselves back in the gallery game here on Whidbey in a few years. We do hope to see you all here on the island. Please let us know if we can answer any questions or concerns that you may have.